596 is the codename of the People's Republic of China's first nuclear weapons test, detonated on October 16, 1964 at the Lop Nur test site. It was a uranium-235 implosion fission device and had a yield of 22 kilotons. With the test, China became the fifth nuclear power. Project 596 was named after the month of June 1959 in which it was initiated, immediately after Nikita Khrushchev decided to stop helping the Chinese with their nuclear program 20 June 1959. The People's Republic of China began developing nuclear weapons in the late 1950s with substantial Soviet assistance. The order for the Chinese nuclear weapons program, designated by the codename of "02", was given by Chairman Mao Zedong himself, who believed that without a nuclear weapon China would not be taken seriously as a world power. The events of the First Taiwan Strait Crisis of 1954-55 cemented Mao's belief that unless China had nuclear weapons of its own, it would constantly be under the threat of nuclear blackmail from the United States. Prior to 1960, direct Soviet military assistance had included the provision of advisors and a vast variety of equipment. Of the assistance provided, most significant to China's future strategic nuclear capability were an experimental nuclear reactor, facilities for processing uranium, a cyclotron, and some equipment for a gaseous diffusions plant. At one point the Soviet Union even agreed to supply a prototype nuclear weapon for analysis by the Chinese; this agreement was not, however, put into effect. When Sino-Soviet relations cooled in the late 1950s and early 1960s, the Soviet Union withheld plans and data for an atomic bomb, abrogated the agreement on transferring defense technology and, starting in 1960, began the withdrawal of Soviet advisors. Despite the termination of Soviet assistance, China committed itself to continue nuclear weapons development to break "the superpowers' monopoly on nuclear weapons", to ensure Chinese security against the Soviet and United States threats, and to increase Chinese prestige and power internationally, especially with France recently emerging as a new nuclear force in February 1960 (Gerboise Bleue). The first Chinese atomic bomb, code-named 596, was detonated on October 16, 1964 at the Lop Nor nuclear test site. 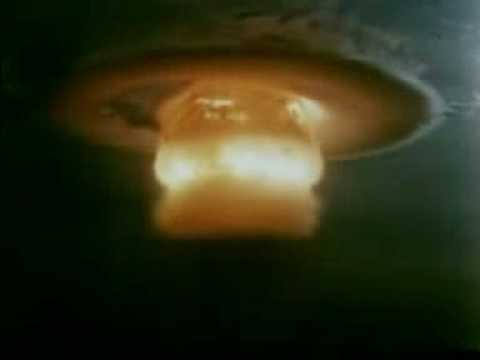 It was an implosion-style nuclear weapon, though it utilized uranium-235 exclusively for its core — most countries which pursue implosion technology use plutonium for their first cores, because it is usually easier to produce than uranium-235 — as at the time it had not developed plutonium-production technology. The test had a yield of 22 kilotons. China would manage to develop a fission bomb capable of being put onto a nuclear missile only two years after its first detonation, and would detonate its first hydrogen bomb only three years later in 1967. The United States intelligence agencies were caught off-guard by the Chinese test in 1964. Despite having photographed pre-test preparation at the Lop Nur nuclear testing site, many U.S. analysts believed that the Chinese were still months, if not years, away from having a functional nuclear weapon, in part because they erroneously assumed that the first Chinese bomb would be plutonium-fueled and that their Lanzhou diffusion enrichment facility was not yet operable (even though it had actually produced enough highly-enriched uranium for a number of bombs by that time). The U.S. analysts additionally misidentified a facility designed to produce uranium tetrafluoride as a plutonium production facility, making their estimates of Chinese plutonium production significantly off. It was only after radiochemical analysis of the fallout cloud from the Chinese test conclusively demonstrated that the bomb had been a U-235 implosion device, that these errors were re-examined in detail. Annotated bibliography on the Chinese nuclear weapons program from the Alsos Digital Library for Nuclear Issues.